The Cedar Cutter is a well known and locally beloved sculpture located in adjacent to the car park in Knox Park, Murwillumbah. This article is a reprint of a brochure originally printed courtesy of local community identity Phil Taylor, which provides a brief introduction about the founding of the Tweed, and the place of Cedar cutters in establishing it. 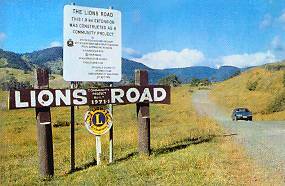 The Lions Road Scenic Link. Wooyung - A History The first whites were timber getters hunting for red gold. Stumps of red cedars can be seen from Jones's Road marked by the cuts used to support standing planks. Organising a series of free weekend seminars, Max Boyd provides a starting point for discussion and feedback for various industries, promoting sustainable development in the Tweed, in the lead up to Local Government elections on March 27th. Walk of Remembrance and Centaur Memorial. During the Second World War, 41 allied naval and merchant ships were sunk off Australia's coast by enemy action. Hundreds of service personnel and merchant seamen were killed in these tragedies. The Paths of Yoga - Unity in Diversity, by Filomena Aversa, practitioner and teacher in Byron Bay, NSW, Australia. A brief introduction to the origins of Yoga and the various philosophical systems (Darshanas) which yoga students and practitioners can apply. Local Dog Exercise Areas and dog friendly places in Byron Shire. A short article about dog walks, designated pet friendly areas and some eateries around Mullumbimby and the Byron Shire. Rare Mouse Found in the Border Ranges National Park. Considered to be extinct until it was re-discovered in 1981, a new population of an endangered native mouse has been found for the first time in the World Heritage listed Border Ranges National Park. 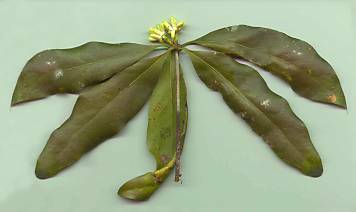 Nightcap Oak A New Rainforest Tree Species for New South Wales. The discovery of a new rainforest tree in the forests of the Nightcap Range in far northern New South Wales has excited the botanical world, and focused a spotlight on the spectacular Mt Warning Caldera and its World Heritage National Parks and Reserves. One night only! Limpinwood Amphitheatre 5pm April 28. The Jar are considered amongst Australia's finest traditional folk musicians, renowned for giving dynamic performances straight from the heart, and having relevance and enthusiasm for a wide audience. Join us for a pre performance buffet dinner or set up early and watch the sun set and stars come out! Julian Rocks Marine Reserve. Established as a marine reserve in 1982, after 10 years of lobbying by local users, Julian Rocks is one of Australia's top dive spots. By Wandy Brouwer & Tim Hochgrebe of Planula Diver's Retreat. Byron Bay finally has a “legal” Clothing Optional Beach ... 3 glorious kilometres of clean, uncrowded white sand, clear unpolluted seas and great surf. A report by Peter Bentley of Sense Adventures. Cocktails with Noel and Gertie. presented by Top Hat Productions adapted from the works of Noel Coward and Gertrude Lawrence. One evening performance on 8 April 2000 in the bush garden setting of the Limpinwood Amphitheatre. Science-Art Festival Symbols of Our Age Seminars, Exhibition, Forum and Concert, re-uniting the sciences and the arts ushering in a New Renaissance. What could Oscar Wilde's Salome, Tadashi Suzuki's Actor Training Method and a Tea House in Limpinwood possibly have in common? Read the review of the HOT HOT HOT! original performance by Brisbane's Frank Theatre. Frank Theatre returns to Wollumbin for their third season presenting Salome, by Oscar Wilde. In May 1998, at the Limpinwood Amphitheatre adjacent to The Teahouse, Limpinwood, Frank Productions presented 3 evening performances of Macbeth, Crown of Blood. In March 1999 they returned with Heavy Metal Hamlet. In October we will be treated to a musical and colourful production of Salome. You'd be mad to miss it! Tomewin - A History The modern history of the Tomewin region dates from the mid 19th century when first settlers engaged in timber getting, cattle grazing and banana growing. Wholesome, Sustainable Outdoor Education in the Tweed, by Greg Smith. Adventure, fun, challenges, healthy risk taking, and quiet reflection are ... offered to schools and tertiary students participating in core components of the education curriculum, the Outdoor Education Curriculum. An introduction to the Minjungbal Aboriginal Cultural Centre (Tweed Heads Historic Site) and Bundjalung people of Wollumbin. The Bundjalung people for many miles around called the mountain Wollumbin, ... it was an important sacred site, as their lives and religion were strongly linked to the land. Heavy Metal Hamlet, an intriguing open air adaptation of Shakespeare's Hamlet. Two evening performances in March in the bush garden setting of the Limpinwood Amphitheatre. The Big Climb by Stuart O'Neill. Climbing Mount Warning in the World Heritage Central Eastern Rainforests (CERRA) of Australia sometimes results in unexpected rewards. Tweed Economic Development Corporation launches Ready for Business Investment portfolio launched by the TEDC, to encourage economically and environmentally sustainable development in the Tweed Shire. Osprey Breeding Observations Spring of 1998 has been a great year for fledging of Ospreys on the Tweed River estuary and the Tweed Coast. National Parks and Wildlife Service officers rescued a pair of chicks from serious difficulties during a banding program. Australian Whaling History by Max Egan, Centre for Coastal Management, Southern Cross University. Whaling was Australia's first primary industry. Hunting was initially carried out from small boats and the whales were towed back to a shore station for processing. We all know that Ecotourism means sustainable nature based tourism. By definition it also means cultural tourism. Murwillumbah is truly central to the natural and cultural assets of the World Heritage areas of the Wollumbin Caldera. Carmel Harris reckons it is central to cultural life of the region and a fine example of a truly rural town that has preserved its history and heritage. The magnificent Wedge Tail Eagle was once hunted to the verge of extinction, and is the largest bird of prey in Australia. With a wing-span of up to 2.5 metres, they soar and glide majestically in the air currents. They belong to the group of birds which also includes the golden eagle and other impressive birds. By Bob Moffat, NSW NPWS Ranger. 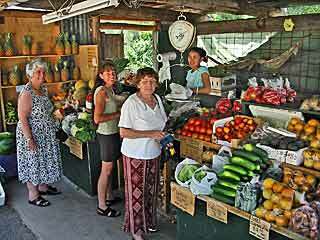 For general website updates, see What's New in Wollumbin?